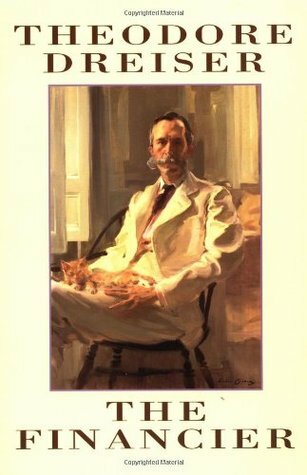 For those disheartened by the current state of politics/economics, The Financier by Theodore Dreiser is probably not the best book to read. It’s not a satisfying novel for those who hope that at least in fiction, justice will prevail. Published in 1912, this is one of those brilliant classics that is as relevant today as when it was written, no matter how much we may wish it was not relevant. Frank Cowperwood was the son of a mediocre banker in post-Civil War Philadelphia. Frank knew from an early age that he was going to make scads of money. Shrewd, brutally intelligent, and completely amoral, Frank made his way up in the world working at various finance-related jobs until he was able to open his own brokerage company. He came to the attention of various wealthy, none-too-scrupulous, politically connected men in the city who were impressed by his understanding of the intricacies of the world of finance. He made money hand-over-fist, but too slowly for his liking, especially because he could see there was real money to be made if only he could take over the streetcar lines in growing parts of the city. For that, he needed even more capital. His big break came when the newly-elected city treasurer, a dull political hack, appointed because he was weak and biddable, came to him for financial advice: he needed to sell city bonds for more than most people were willing to pay for them. Frank knew how this could be done in a way that would allow him to skim a good deal of money off the top, with a little on the side for the treasurer as well. Although not legal in a strict sense, "everybody was doing it." Frank was not only grasping when it came to money. While fairly young, he married a pretty, wealthy widow whose bewildered reluctance he easily overcame. He bought a large house and furnished it expensively. He had two children. But all the while, his main goal was ever more money. He fell in with a wealthy businessman who also speculated in just about everything, Edward Butler. They had a mutually beneficial working relationship and for a time liked, or at least respected, one another. But Butler had a beautiful, high-spirited, young daughter. It wasn’t long before Frank put her on his list of things to acquire. Pampered, spoiled, and convinced no man was good enough for her except for the wealthy Mr. Cowperhood, Aileen Butler rushed headlong into her seduction. Adultery, betrayal – none of this meant anything to these two excruciatingly selfish people. Frank continued to use city money for self-aggrandizement while seeing Aileen on the side. Everything was going swimmingly for him until the Great Chicago Fire. The ensuing financial panic reached Frank even in Philadelphia as insurance companies, banks, and businesses failed. Frank was overextended, owing money to creditors who wanted it speedily as well as being five hundred thousand dollars in the hole to the city. On shaky legal ground, he was nevertheless confident he’d done nothing wrong. At least, not wrong enough to ruin him or land him in jail. The city treasurer was in a worse position, being such a poor steward of public funds. Frank tried to intimidate the man into lending him even more city money so that they (or at least Frank) could get through the worst of it. For once, Frank’s schemes didn’t work. His exposure was so great that to buy time he tried to enlist men more wealthy and powerful than himself. He had the gall to go first to Butler. With an election coming up, the wealthy businessmen of the city hunkered down and looked for someone to blame for the misuse of city funds. They pulled their support from their treasurer-puppet. Someone would have to take the fall, either Cowperwood or the treasurer. Or both. At just this time, Aileen and Frank were found out, thanks to an anonymous tipster. Butler, an aggrieved, infuriated, broken-hearted father, convinced his cronies that Frank should be the scapegoat. Frank is such an awful person, that even though everyone is greedy and awful in his sphere, the magnitude of his offenses and his utter lack of remorse makes the reader hope for his downfall. Aileen is obstinate in her refusal to believe anything Frank may have done should hurt them. Wrong or not, if she and Frank benefitted, nothing else mattered. She doesn’t care who gets hurt and even blames her father for trying to keep her from her lover. Frank is convicted and sentenced to the penitentiary. Readers may rejoice. But don’t be fooled into thinking karma got him. Even there, privilege buys him special treatment. He adapts. He’s released early. He ends up with Aileen. It’s a devastating ending. The novel is written in old-fashioned style with an omniscient narrator and dense details of the financial world. Every new character is introduced with wordy physical description that stops the action dead. And yet, the book is gripping. I didn’t want to put it down. There is a sequel that follows Cowperwood west to Chicago. I’m sure I’ll have to read it at some point. But I’m too drained now by the apparent triumph of such disgusting people.